Happy Monday-After-Easter, everyone! I hope you’re recovering from eating copious amounts of chocolates yesterday, or if you did not have chocolates yesterday, I hope you are recovering by eating said chocolates today! 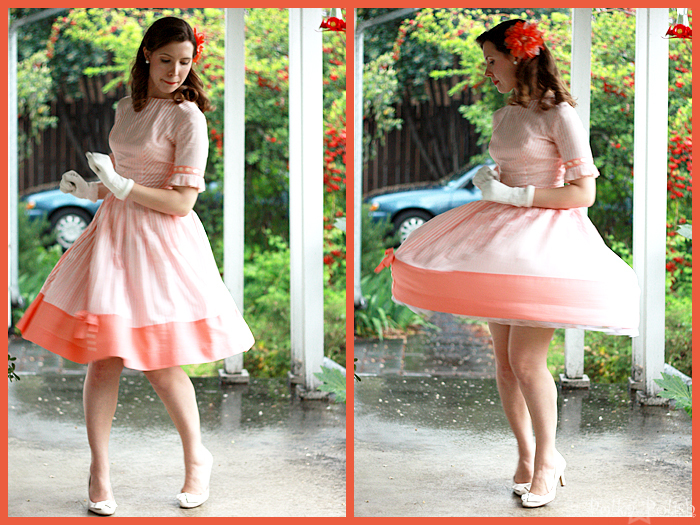 I decided to wear one of my two new dresses from Expo for Easter Sunday… it’s just so bright and spring-y! I felt just like an Easter egg. I was only disappointed that I didn’t have an appropriate hat to wear with it. The weather for Easter wasn’t exactly bright and springy here… in fact it thundered and rained for most of the evening. The storm nearly scared our dinner guests into staying home! Thankfully, they eventually braved the rain and we had a lovely feast of grilled turkey, veggies, and chocolate cake! 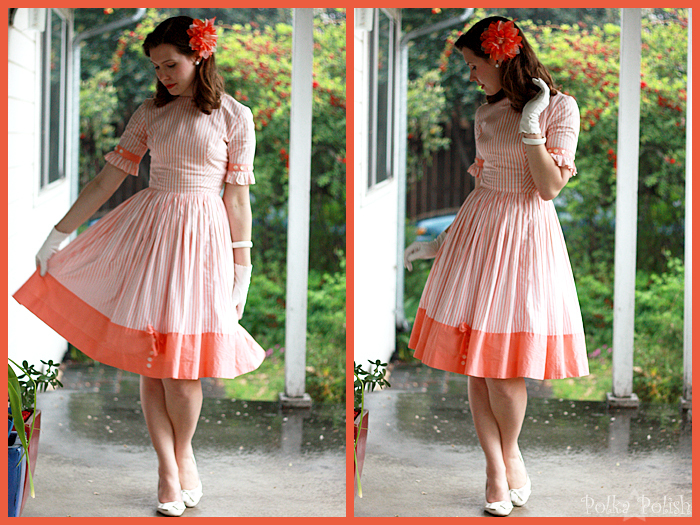 As I have mentioned before,orange peach isn’t exactly at the top of the list of my favorite colors to wear, but this dress just fit so nicely and had so many clever little details that I just had to get it. 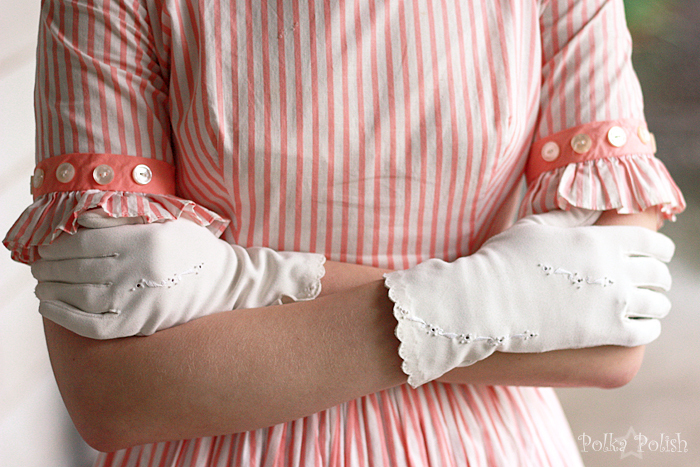 I think the little ruffles on the sleeves are my favorites. 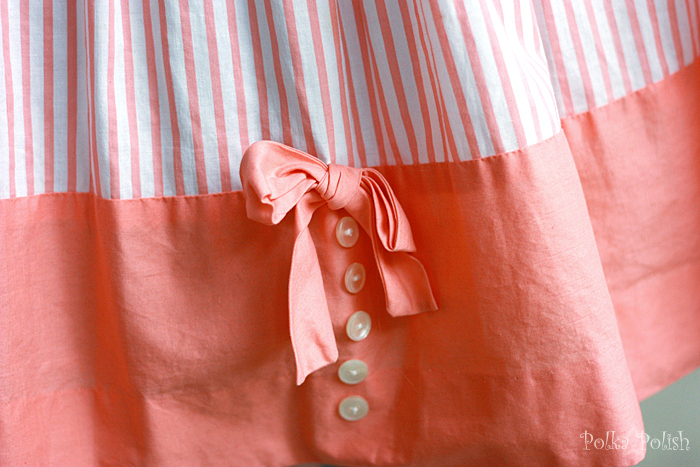 And the bow and button detail on the front. And the pleating in the skirt. Actually, I love the whole thing.